At a Freight Open Mic in 1975, five daring young women took the stage to play bluegrass. Imagine: women playing bluegrass! What an idea! Oh, and the group needed a name. Their spur-of-the-moment choice? The Good Ol’ Persons – a name that winked at the good ol’ boys of bluegrass and cleverly claimed full membership in the club. The lineup changed over the years, but the name still brings a warm glow to bluegrass lovers in the Bay Area and beyond, and tonight several stalwarts from the band’s glory days – glory decades, really – gather to celebrate the music and have a good time at the coffeehouse that started it all. 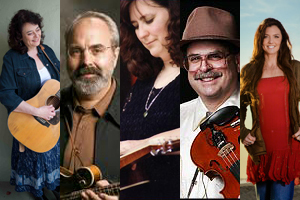 With Kathy Kallick on guitar and vocals, John Reischman on mandolin and vocals, Sally Van Meter on dobro and vocals, Paul Shelasky on fiddle and vocals, and longtime friend of the band Trisha Gagnon on bass and vocals, these Persons will bring new life to some fine ol’ songs! Kathy, Sally, and John are Grammy and International Bluegrass Music Association award winners, Kathy and Paul were awarded Lifetime Memberships by the California Bluegrass Association, and all are outstanding performers, composers, producers, and teachers. Kathy leads The Kathy Kallick Band. John leads the Jaybirds. Sally has worked with Hillman & Pedersen, Led Kaapana, Jorma Kaukonen, Mary Chapin-Carpenter, the Nashville Bluegrass Band, Jerry Garcia, and Leftover Salmon. Paul, after playing for many years with Lost Highway, is currently a member of two local favorites, Blue & Lonesome and The David Thom Band. Trisha played in the award-winning Canadian band Tumbleweed and won the 2011 World Jam Championship in Scotland. The Good Ol’ Persons were one of the first bluegrass bands to feature the songwriting, lead playing, and vocal harmonies of women, and one of the first to infuse their bluegrass with influences from Latin, swing, folk, Cajun, and other musical genres. The band has had a profound influence on generations of bluegrass musicians – not to mention the fans who fell in love with the music. Don’t miss this chance to see some of the Freight’s favorite Persons!